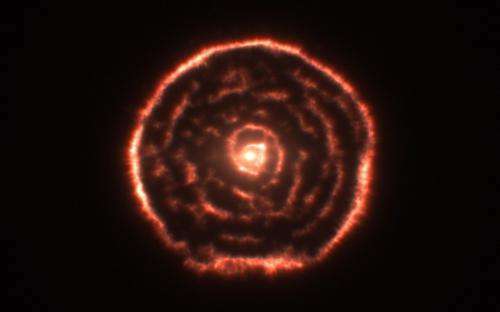 (Phys.org)—Astronomers using the Atacama Large Millimeter/submillimeter Array have discovered a totally unexpected spiral structure in the material around the old star R Sculptoris. This is the first time that such a structure has been found around a red giant star. It is also the first time that astronomers could get full three-dimensional information about such a spiral. This work is one of the first ALMA early science results to be published. A team using the Atacama Large Millimeter/submillimeter Array (ALMA), the most powerful millimetre/submillimetre telescope in the world, has discovered a surprising spiral structure in the gas around the red giant star R Sculptoris. This means that there is probably a previously unseen companion star orbiting the star. The astronomers were also surprised to find that far more material than expected had been ejected by the red giant. "We've seen shells around this kind of star before, but this is the first time we've ever seen a spiral of material coming out from a star, together with a surrounding shell," says the lead author on the paper presenting the results, Matthias Maercker (ESO and Argelander Institute for Astronomy, University of Bonn, Germany). Because they blow out large amounts of material, red giants like R Sculptoris are major contributors to the dust and gas that provide the bulk of the raw materials for the formation of future generations of stars, planetary systems and subsequently for life. Even in the Early Science phase, when the new observations were made, ALMA greatly outperformed other submillimetre observatories. Earlier observations had clearly shown a spherical shell around R Sculptoris, but neither the spiral structure nor a companion was found. "When we observed the star with ALMA, not even half its antennas were in place. It's really exciting to imagine what the full ALMA array will be able to do once it's completed in 2013," adds Wouter Vlemmings (Chalmers University of Technology, Sweden), a co-author of the study. Late in their lives, stars with masses up to eight times that of the Sun become red giants and lose a large amount of their mass in a dense stellar wind. During the red giant stage stars also periodically undergo thermal pulses. These are short-lived phases of explosive helium burning in a shell around the stellar core. A thermal pulse leads to material being blown off the surface of the star at a much higher rate, resulting in the formation of a large shell of dust and gas around the star. After the pulse the rate at which the star loses mass falls again to its normal value. Thermal pulses occur approximately every 10 000 to 50 000 years, and last only a few hundred years. The new observations of R Sculptoris show that it suffered a thermal pulse event about 1800 years ago that lasted for about 200 years. The companion star shaped the wind from R Sculptoris into a spiral structure. "By taking advantage of the power of ALMA to see fine details, we can understand much better what happens to the star before, during and after the thermal pulse, by studying how the shell and the spiral structure are shaped," says Maercker. "We always expected ALMA to provide us with a new view of the Universe, but to be discovering unexpected new things already, with one of the first sets of observations is truly exciting." In order to describe the observed structure around R Sculptoris, the team of astronomers has also performed computer simulations to follow the evolution of a binary system. These models fit the new ALMA observations very well. "It's a real challenge to describe theoretically all the observed details coming from ALMA, but our computer models show that we really are on the right track. ALMA is giving us new insight into what's happening in these stars and what might happen to the Sun in a few billion years from now," says Shazrene Mohamed (Argelander Institute for Astronomy, Bonn, Germany and South African Astronomical Observatory), a co-author of the study. "In the near future, observations of stars like R Sculptoris with ALMA will help us to understand how the elements we are made up of reached places like the Earth. They also give us a hint of what our own star's far future might be like," concludes Matthias Maercker. More information: This research was presented in a paper, "Unexpectedly large mass loss during the thermal pulse cycle of the red giant star R Sculptoris", by Maercker et al. to appear in the journal Nature. "Earlier observations had clearly shown a spherical shell around R Sculptoris, but neither the spiral structure nor a companion was found." When did this spherical shell turn into a ring? Stars explode due to extreme spin. Centrifugal force at the equator allow a small area to erupt as the star collapses in all other areas, like a hole in a balloon. The spiral is created by the eruption and rotation of the star. As the material slows, it creates the ring as the spirals bunch up. It is the spin of stars that allow gravity to compact them to the point where runaway fission may occur and create the explosion. Fusion doesn't occur in stars except during these explosions or when they collide at the centers of galaxies. i don't see what's so surprising about seeing spiral structure in a red giant turing into a planetary nebular. But, I must say, i'm excited about ALMA! Likely the giant unstable star has grown so large to expel new material as it slowly spins. Periodically, it likely erupts explosively in all directions, producing intermittent concentric rings. This in not rocket science. Acknowledge the obvious, rather than dreaming up contrived explanations based on outdated, shaky physics models. Centrifugal force at the equator allow a small area to erupt as the star collapses in all other areas, like a hole in a balloon. Oh yeah, another headache but it can't be helped,,, you'll also have to learn a little something about rotational dynamics. Only THEN you will be able to comment on things that go 'round. Hole in a balloon ya say? Okee dokee then. It is the spin of stars that allow gravity to compact them to the point where runaway fission may occur and create the explosion. Fusion doesn't occur in stars except during these explosions or when they collide at the centers of galaxies. I thought that you thought the spin was causing the so-called "centrifugal" force to throw stuff out, not cause it to collapse. You're still exactly backwards with your fission and fusion. Fusion is due to the gravitational pressure compressing the material. Fission happens when there is no longer a fusion fuel source and fusion quits creating heat/radiation pressure to counter the gravitational pressure. Then the collapse due to gravity can not be balanced (hydrostatic equilibrium) and increases until fission occurs or a black-hole is created, depending on the mass of the core. Would it cost too very much for you to buy a "Physics for Dummies" or a "Complete Idiot's Guide to Physics"? "I thought that you thought the spin was causing the so-called "centrifugal" force to throw stuff out, not cause it to collapse." I never said centrifugal force caused it to collapse. It collapses when pressure is released. I said spin allows gravity to compact matter and it also causes centrifugal force which causes the opposite. Spin of the star causes orbital velocity in particles, reducing their spin velocity and their magnetic fields. Their total energy remains unchanged. Gravity can't overcome magnetism, but when the particle fields are lessened, they can be compacted. Field reduction of particles has a greater affect than centrifugal force or centripetal force if you prefer. explosion at the direct center of the star, leaving no core behind. Don't tell me this is more likely than an oversized continous mass ejection. The spiral took time to form. An instantious explosion did not create it. Actually there is no fission in a star, when the star collapses it explodes as a supernova, fusing material into elements that would not otherwise be made in a star due to the fact that it costs more energy to make elements heavier than iron than you get out in a fusion reaction. "We've seen shells around this kind of star before, but this is the first time we've ever seen a spiral of material coming out from a star, together with a surrounding shell,"
Oops! Wouter has corrcted me. It is the combination of spiral and sphere that is apparently unique. The spin of the star reduces the magnetic fields of particles, just as a particle accelerator reduces the field to the point that the magnets in the accelerator have little affect in increasing its speed farther. The mass does not increase, much less approach infinity. The same reason a photon, which has mass, doesn't hit you like a bowling ball. Reduction of the fields is what allows the particles to collide. By this token, spinning an electromagnetic generator more quickly should make it less effective (by reducing the rotor's magnetic field). This is not the case. a particle accelerator reduces the field to the point that the magnets in the accelerator have little affect in increasing its speed farther. (BTW, it's "effect" here, not "affect".) The magnets in an accelerator are not for changing the speed; they are for changing the direction of travel of the particles. mass does not increase, much less approach infinity. It does increase; that's why the drive frequencies of accelerators need to be adjustable. The same reason a photon, which has mass, doesn't hit you like a bowling ball. Photons carry momentum, not mass in the usual sense. Reduction of the fields is what allows the particles to collide. No, oppositely directed momenta do that. Mr. Yarbrough draws a lot of heat for his views, but the responses to some of his "ideas" helps in my understanding of the science involved. So, carry on Mr. Yarbrough. "By this token, spinning an electromagnetic generator more quickly should make it less effective (by reducing the rotor's magnetic field). This is not the case"
In case you don't know, a particle and its field are unique as compared to an atom or a generator for that matter. A particle has only linear momentum and spin momentum. Particles inside an atom also have orbital momentum. Changing the overall spin of an atom does not necessarily increase the linear momentum of the overall atom. It can just as easily alter the orbital momentum of its sub particles. The key is that the total energy remains constant. "The magnets in an accelerator are not for changing the speed; they are for changing the direction of travel of the particles." A particle accelerator is a device that uses electromagnetic fields to propel charged particles to high speeds and to contain them in well-defined beams. Wikapedia. "It (mass) does increase; that's why the drive frequencies of accelerators need to be adjustable." According to Einstein and Newton, what do you suppose would happen to increasingly massive objects in close proximity to each other? In case you don't know, a particle and its field are unique as compared to an atom or a generator for that matter. In case *you* don't know, the rotation of a star--gross, macro-scale motion--does not reduce particles' intrinsic magnetic fields. A particle accelerator is a device that uses electromagnetic fields to propel charged particles to high speeds and to contain them in well-defined beams. Wikipedia. A linear accelerator uses reversing charges (and no magnetic fields). A circular accelerator uses radio-frequency photons to add energy to the particles; it uses magnetic fields to bend their path. When you cite a reference, make sure you've read it first. They would increasingly attract each other, of course. Are you trying to imply that beam confinement in an accelerator is due to gravitation between the particles? 1) A thin shell of emitting gas will look like a "ring" when seen from a distance because in the middle you look through one (or two) thicknesses of the shell, but on the edge you look down the edge and there is more matter in the line of sight. An ellipsoidal shell would look like an ellipse, rather than a circle. 2) The shells are ejected by thermal pulses of an AGB star, which has very weak surface gravity. Rotation has nothing to do with the ejection mechanism. "Three prototype antennas have undergone evaluation at the Very Large Array site in New Mexico since 2002." I don't see a 'spiral' here. Look at the inner (bright) part. That does look like a spiral, doesn't it?. And that seems to be the part They are referring to - not the entire thing you see in the picture. It is also not inconceivable that the rest of the structure originated similarly and then just moved outward. Then again: The human eye (more precisely: the brain) does try to find patterns in things. And sometimes that faculty finds patterns that aren't there at all. But since the data they have is 3D (as noted in the article) I'm willing to bet that they do have the mathematical wherewithal to distinguish a spiral fom shells. When did this spherical shell turn into a ring? The nebula didn't change, ALMA's improved resolution is able to see detail that was not previously discernible, that's the point of the article. To be precise, the energy of a massive particle increases more rapidly as a function of speed than the square. If you dived the kinetic energy by v^2, you get a "relativistic mass" figure which appears to increase with speed. If you us the more complex corect formula, mass is invariant. It is a curious historical irony that "relativistic mass increase" is part of aether theory but not part of relativity. "I don't see a 'spiral' here"